PSB as I like to call it is now in season.This delicious, little known vegetable, a brassica, is also known as a ‘SUPER FOOD’, with some good reason. It is known to have anti-prostate effects, it contains ‘sulphoraphane’ an anti-cancer substance, high levels of VIT C, fibre, and selenium among many many other health benefits. If that wasn’t a good enough reason to eat it, it is also very tasty. My favorite way to cook it [though it is lovely raw] is to flash it in a pan with a little oil [of your own choosing] then add alot of garlic [I love garlic] a little ginger and a little chilli [sesame seeds if you like]. It is very important not to over cook it and if you decide to boil it just one minute in boiling water or a couple steaming is plenty. 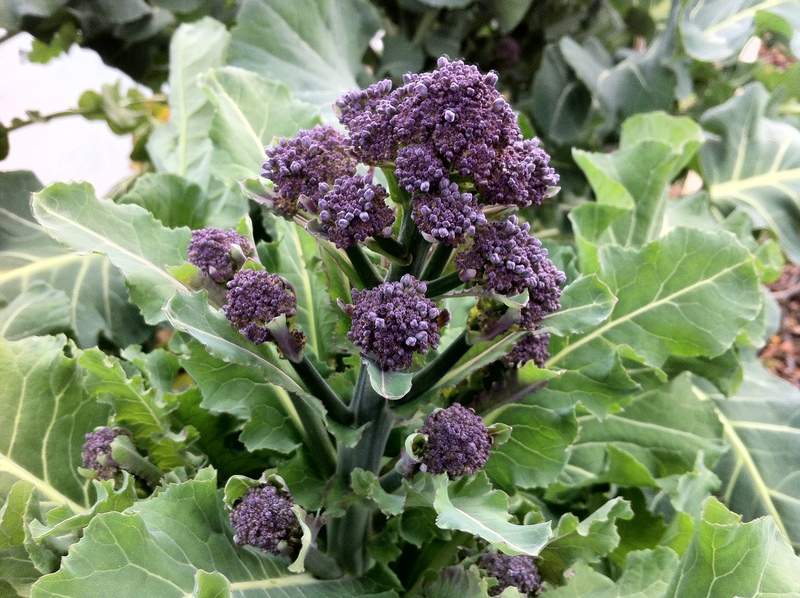 PSB is not easy to get hold of which is why if you are reading this you are one of the lucky ones as we have it in stock from our own garden at the moment. It has been waiting to burst into life in the ‘spring’ since it was planted out last autumn.Make the most of it now when there are hardly any other green vegetables in season and kick start your eating local summer!